Indian Railways Center for Railway Information System (CRIS) and RailYatri.in have jointly launched RailRadar for tracking Indian trains. 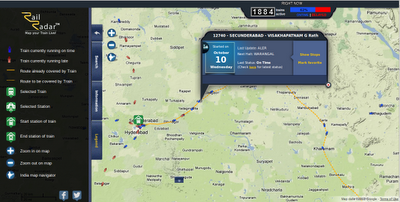 RailRadar enables users to track moving trains in near-real time (the information is delayed by 5 or more minutes). Till recently train running information was available to a user in textual format - a user enters train name/number and the system provides appropriate information like next stoppage, estimated arrival time etc. With RailRadar all this is set to change. A user is presented with ubiquitous Google Maps showing trains running across the nation. Hence this is a giant leap by Indian Railways in terms of usability! The launch of RailRadar also marks the demise of SIMRAN (Satellite Imaging for Rail Navigation) Project, which was an ambitious project taken up by Railways in collaboration with IIT Kanpur at a budget of ₹100 crore. Pluggd.in had been tracking the project state since some time now (Link 1 & 2). Anyways the positive thing here is new RailRadar project looks impressive and budget (nation's) friendly. The delay of five minutes or more is mainly due to regulatory and security reasons plus the processing required for enormous amounts of data. How are trains tracked - "A detailed answer for this can be complicated. However in simplistic terms consider that Indian Railways has train passing monitoring points around the country at more than 6000 locations. These monitoring points in real-time mode communicate updates on train arrival, departure, or passing to a central headquarter server. In substantial cases these updates are automated however there are places/situations where this reporting is also done manually." Update: Konkan Railway trains are not shown on RailRadar. The reason for this is Konkan Railways using different system than Indian Railways. @sagarkamat Konkan Rlwys is on a different system than IR. Exploring how to marry the info from both. Can't leave out the beautiful Goa! Follow RailYatri on Facebook and Twitter.